Crops Grown: I couldn’t even BEGIN to name them all. Seriously. I’ve never heard of most of them. Living where I live, doing what I do, you can’t throw a head of lettuce without hitting a vegetable gardener that hasn’t heard of Linda Crago and her heirloom farm Tree & Twig. Linda wasn’t always a farmer, in fact for 13 years she was a social worker. Fulfilling work. Down and dirty work. But she wanted to get her hands dirty in a different way. After buying her house and putting in a regular sized garden the first year she thought she was satisfied. Until the next year when she made her garden bigger. The next year … it was even bigger. That continued on until she got to the point she’s at right now. A full fledged farmer who gave up her career and the security it would provide for a rainy day. 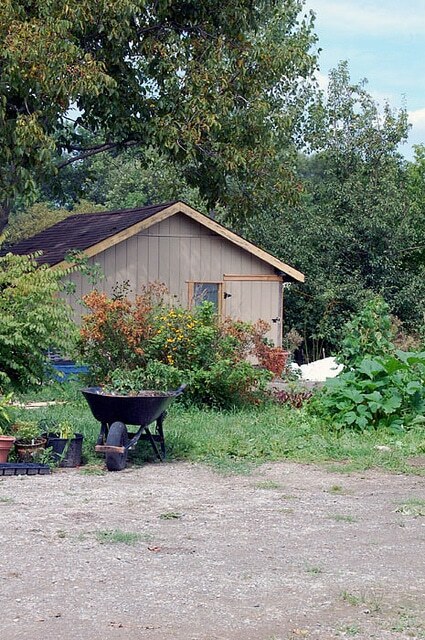 She traded it in to walk around barefoot through rows of experimental vegetables and tried and true heirloom varieties. Now she relies on the occasional rainy day. 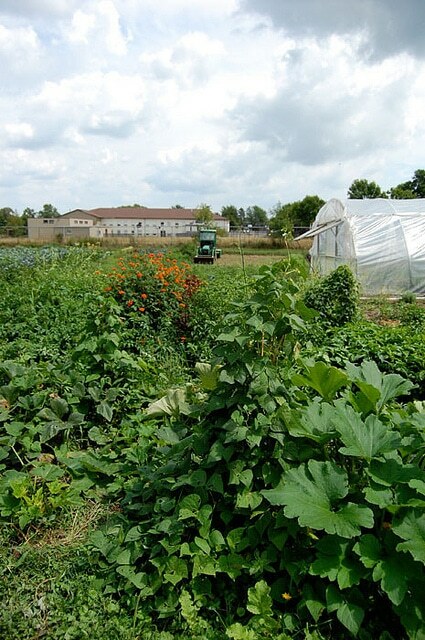 In the past 15 years, Linda’s small vegetable patch has grown into (among other things) a full fledged CSA (Community Supported Agriculture). 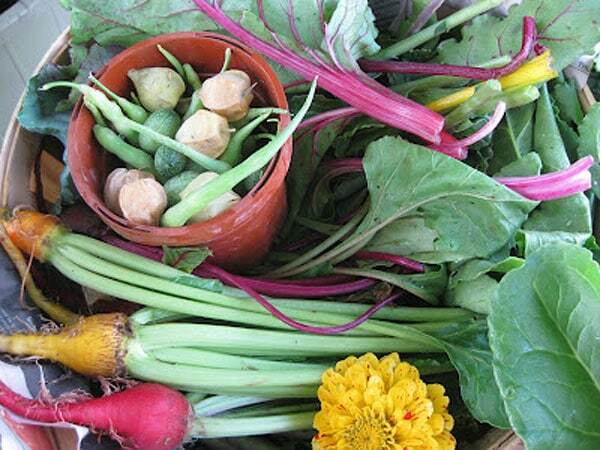 A CSA is where you buy a “share” in a farm. Basically you give the farmer money and the farmer delivers their farm grown produce to you every week for a season. In some cases you pick it up. You can usually get half or full shares and they generally range from $200 – $400 for a season. So that means being part of a CSA every week you get a basket full of vegetables to feed your family. Everything from leaf lettuces to garlic, beets, potatoes, strange vegetables you’ve never seen, beans, peas, carrots … you get the idea. You have no idea what you’ll be getting for the week. 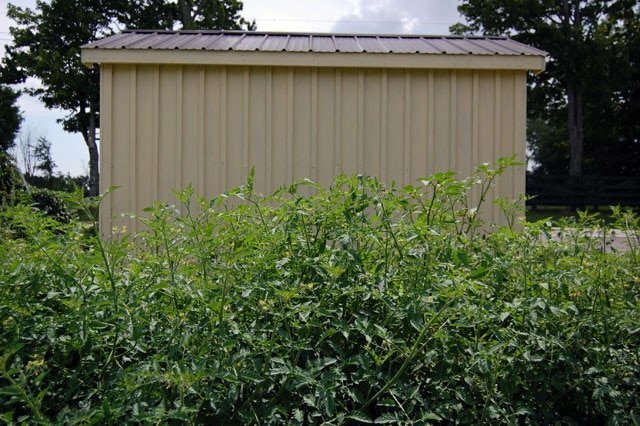 If it’s a bad year for potatoes … not a lot of potatoes. If it’s a great year for beets … lotssa beets. There are usually at least 8 or so different types of vegetables in your basket. Along with selling her wares to local families, markets, restaurants and people like you and me, Linda also sells seeds and seedlings. Every year she takes one day in the late spring to sell a TON of plants on her farm. All seedlings she starts herself from the seeds she’s harvested and saved herself. She also sells her seeds and the occasional seedling online. 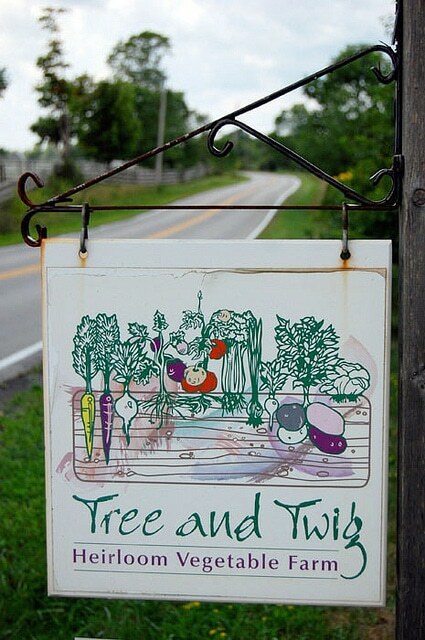 Tree & Twig farm is where I ordered all of my tomato seeds from this year as a matter of fact. (except one … more on that disaster in another post) At the time I was ordering my seeds, Linda invited me to come have a look at her farm. I think she invited me because I asked her if I could come to see it. I kind of begged her. So she said yes. Last Wednesday I spent what was supposed to be an hour and a half at her farm. It was probably closer to the entire day. I was really full by the time I left. Linda doesn’t know that. Look. You can’t leave me alone in 9 acres of food and not expect me to eat it. You just can’t. These are just a FEW of the things you could find on your doorstep if you were to buy a share in a CSA near you. Heirloom tomatoes everywhere. As far as the eye could see there were tomatoes. And not one of them caged, staked or strapped to anything. Linda’s farm is a real farm. She has a passion for farming and vegetables that I wish more grocery store produce managers had. There’s random garden related stuff. EVERYWHERE. To extend her growing season year round she has “hoop houses”. One of 3 hoop houses on the property. In the spring her seedlings go in them, in the summer she fills them with plants she wants to save the seeds from and fall and winter they’re home to dozens of greens, so she has fresh lettuce all year round. Joey. Joey’s a real pig. You will not find Joey in your CSA basket. Joey is a pet. Joey’s not for eatin’. Linda and her daughters are all vegetarians. 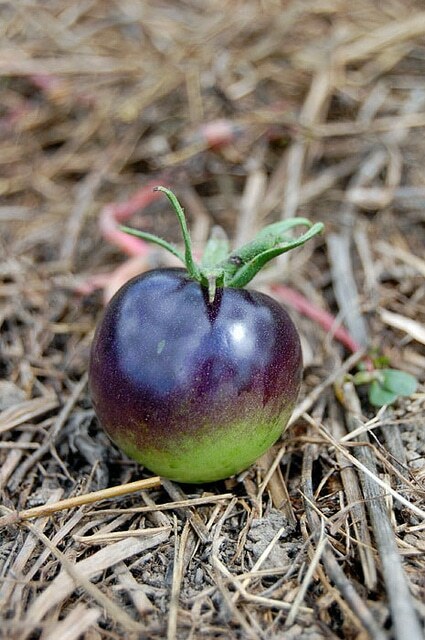 Unripe black tomato which I accidentally knocked off a vine. Which I accidentally walked around with for the rest of the day. Which I accidentally took home with me. 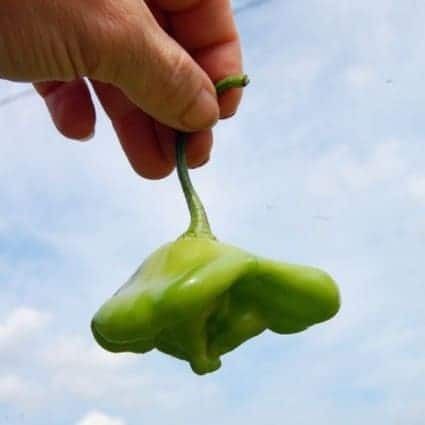 Apparently, according to Linda, there have been studies done and there’s no difference at all between a tomato that’s ripened on the vine and one that’s ripened on your counter. After it ripens at my house in the kitchen, this little tomato will be as nutritious and delicious as if I picked it ripe off of the vine. It was so quiet here I could have cried. 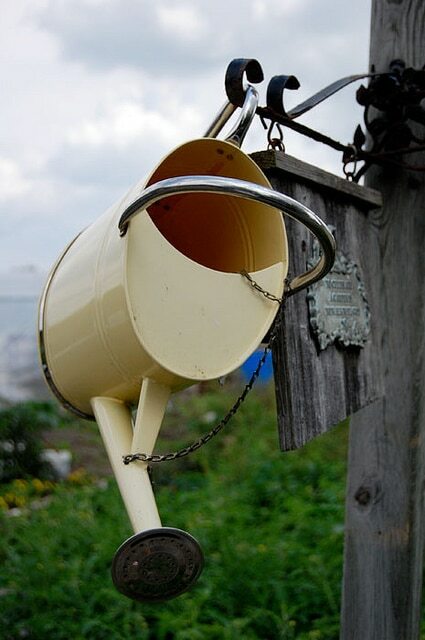 The sounds of my chickens clucking is often drowned out by traffic noise and the fella laughing at television commercials. I tried to do the same thing with this cat as I did with the tomato. Didn’t work. She wanted nothing to do with being shoved in my pocket. The #1 important ingredient in a Salsa Verde. Basil. Rows and rows of Basil. Without a doubt, the absolute BEST tasting one was Lime Basil. If you can find it anywhere, BUY IT. L I M E B A S I L! The star of this show is obviously Linda. Here is the fantastic shot I got of her. I was kind of overwhelmed by the vegetables that day, to the point of dizziness actually. This right here is mint. 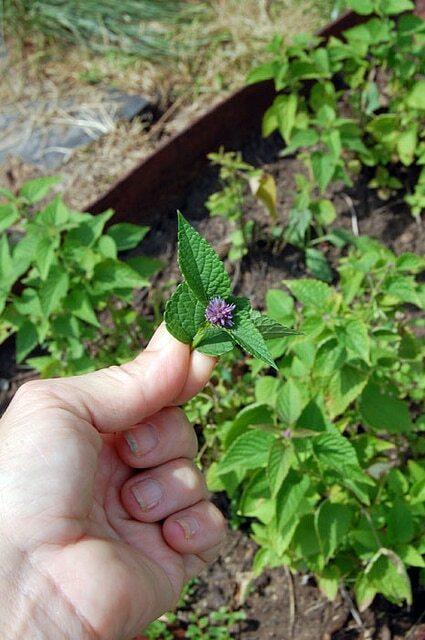 But not just any old mint … it’s spicy licorice mint. And it’s sweet. And delicious. And would be great in a Fennel/Apple salad. And I should have stolen some to root and plant. That’s its home right there in the wheelbarrow. I tried my very first Ground Cherry there. Insert joke here. If ya know what I mean. I ate it then screamed I think. I’m not sure but I think I screamed. It almost tasted like pineapple. I liked it. A lot. It was infinitely more memorable than my first cherry experience. If I remember correctly I shared it with the pig. Joey. one of which she’s had for 11 years! 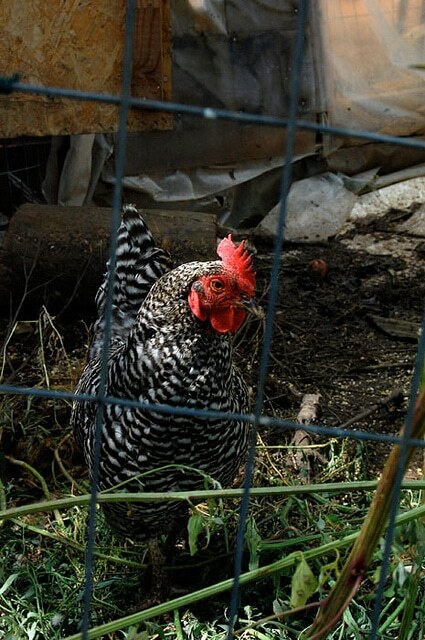 Her 11 year old chicken is named Winnifred and she’s a Mottled Java chicken. She manages to squeeze out an egg or two … a year. 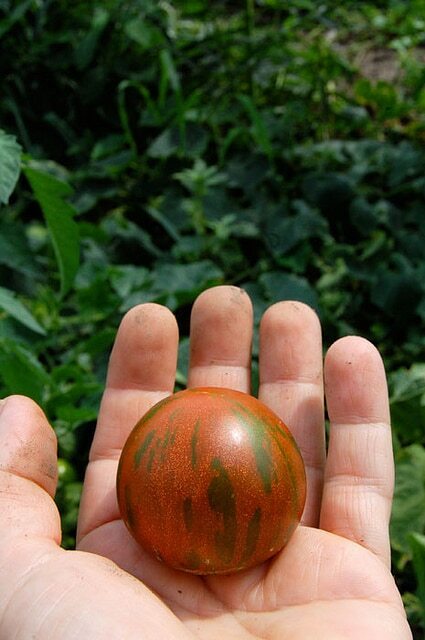 I’ll bet you think this looks like another tomato. It’s not. It’s an eggplant. Can you even imagine getting a basket of food delivered for the week and this beauty being in it. 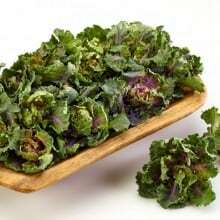 Not all CSAs do this, but Linda includes recipes and serving suggestions for some of the rarer, lesser known vegetables. Probably the only thing, other than the cat, that I recognized immediately at the farm. Duck. I named him/her Daffy. Linda doesn’t know that. 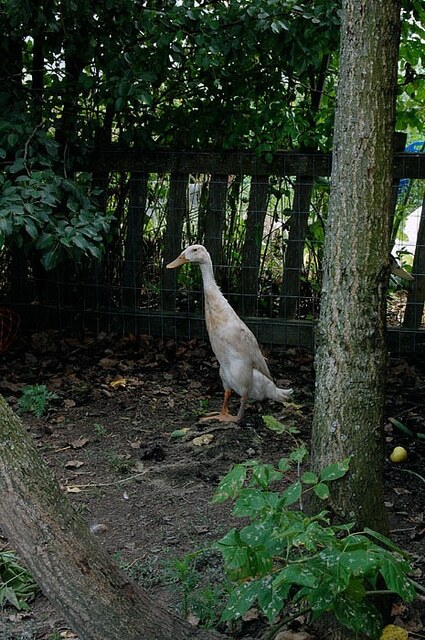 Won’t she be surprised when this duck doesn’t come when she calls him/her anymore. Not Martha Stewart farm prettiness. I can say without a doubt, that I learned more from Linda and her little farm that day than I have in the past several years about gardening. I’ll be sharing some of Linda’s tips and tricks next week. And on Friday I’ll have the strangest of the strange things that Linda is growing. Things that made me laugh out loud when I saw she was growing them, and other things that made me think … I had no idea that was even growable. 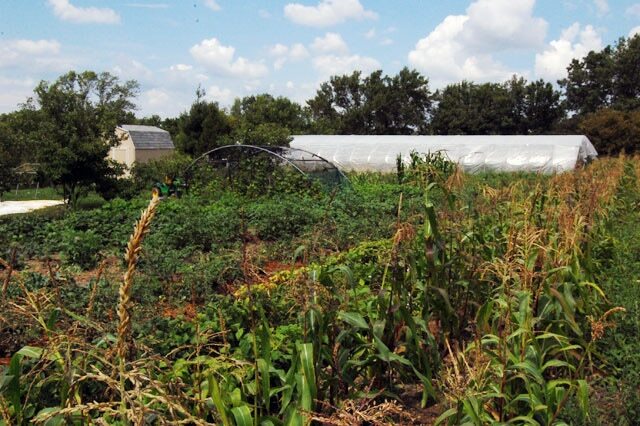 In the meantime, if you’re interested in looking into CSAs in your area to have your vegetables provided by a local farmer, take a look at a few of the links below. If you can’t find the information you’re looking for there just Google CSA and your province or state. 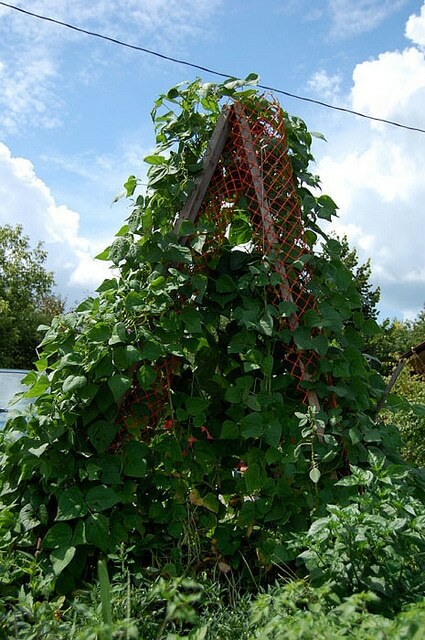 Many of the farms in North America provide baskets for all the seasons. Spring, Summer, Fall and Winter. Some of them will include farm fresh eggs and meat as well. But not Joey. Never Joey. 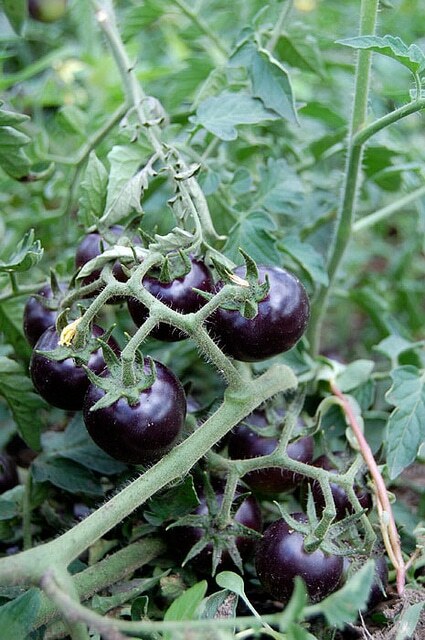 5 Trendy Vegetables to grow this year. How much room will get you HOW many vegetables?! Fab tour of Linda’s farm! 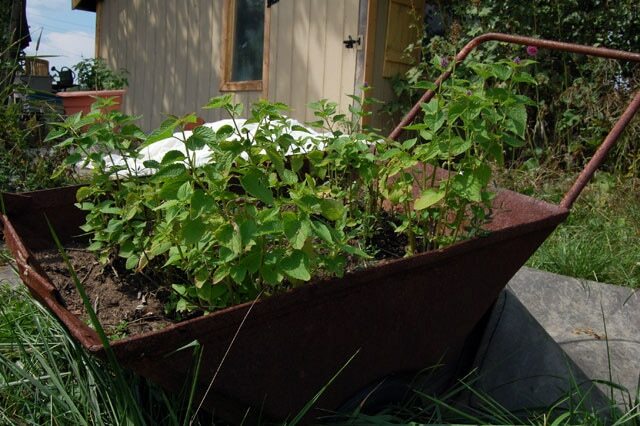 I love the wheelbarrow full of mint, and the Guernsey Island veg, whatever it is…got to google that now. 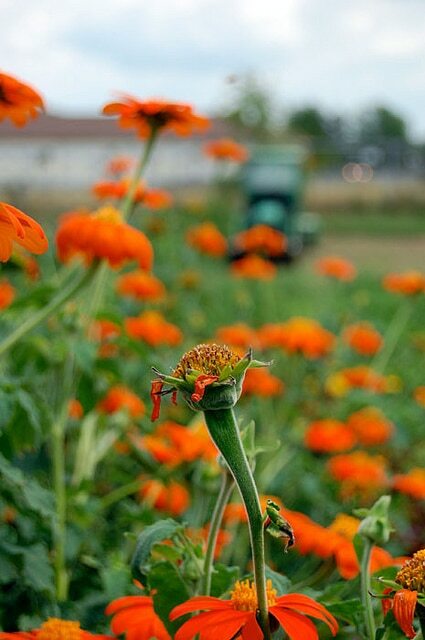 as CSA farmers who grow open pollinated, heirloom varieties, with no chemicals (either organic or synthetic) we thank you for visiting, understanding and writing about such a great farmer! well done! amazing profile! People keeping heirloom veges alive are invaluable. 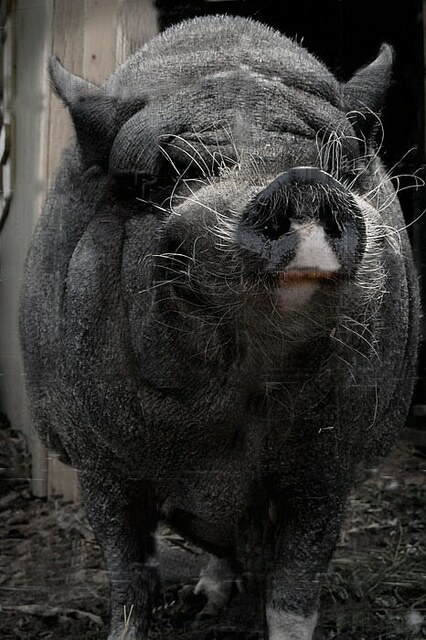 I’m glad joey was a pet pig! Occupation: Had a garden ONCE. While digging up potatoes I dug up a snake. Ran away screaming, never went back. I never thought that I could dig up a snake while digging up my potatoes!! Ahhhh! You know how hard it is going to be for me to plant potatoes next year with that image in my head? I totally feel your pain! Amazing! Do you think she would let me move into her farm shed? I would be sooooo happy there! Hats off Linda! Nice post Karen – inspiring even. 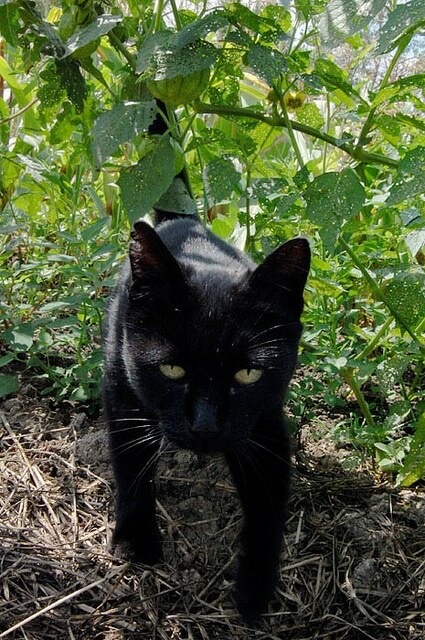 I am going right now to steal a tomato! What a great trip – I would love to spend a day like that. I would take a book and a chair and find a nice heirloom tomato plant to sit under…and read and snack all day! Thanks for the chuckles this morning…greatly needed them. You are informative as always…loved it. When I saw the letters “CSA” I thought, what? ?, she’s in Canada. Down here where I live, CSA translates to Confederate States of America – you know, the ones who lost the Civil War, aka The Northern War of Aggression. Fabulous tour. 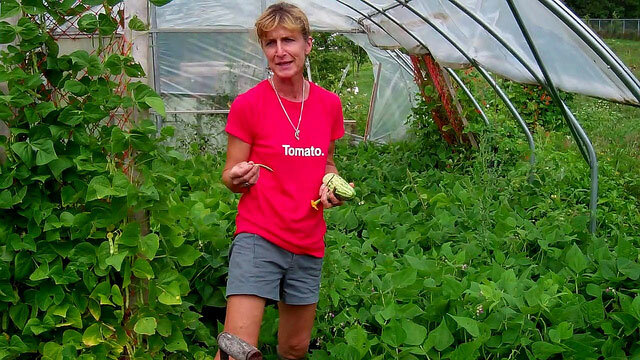 So glad you documented this great gal’s gardens and the movement. We are 4 years into what WAS a successful “pot” garden…NO, not that POT!!! Black walnut trees & the toxins they spew prevent a traditional garden, so we have “farmed out” the deck. Pots of lovely veggies are everywhere. Ahem, WERE everywhere. Our most successful harvest this year is critters. Dennis (the deer), Ricky (raccoon) Charlie (ground hog), Oscar (possum) Sam & Stan (the acrobatic squirrels)…and Captain & Tennille (muskrats). In fairness to Dennis, we have not actually CAUGHT him on the deck but we are pretty sure that was tomato juice staining his fur…and I KNOW I saw him running off with a carrot in his mouth!!! My “fella” is actively involved in the critter relocation program (live trap followed by 10 mile drive), while I am day 3 into canning salsa, up to my patootie in tomatoes purchased from the local farm stand. My entire “pot farm” harvest, 13 cherry tomatoes, 2 heirloom tomatoes, 6 beans, 2 hot peppers, 3 green peppers and a deck full of critter poop. I wonder if Linda can come over to play???? I bet she knows how to get critter pee out of the back seat!!! Oh, can I be the first poster? Beautiful farm and I love the way you presented it. Linda is the kind of farmer I would be if I were a farmer. Alas, I am a gardener. And we are physically just not able to go any bigger than we already are. But to see such beautiful produce grown on plants that obviously do get eaten by bugs because not a drop of poison gets sprayed on them is a wonderful thing. And I can’t wait til Friday!! Oh… That explains why I couldn’t find the comments yesterday morning. Makes perfect sense now. I joined my first CSA this year and LOVE my little basket of goodies I get every Wednesday. My hubby and I have enjoyed a ton of fresh veggies and many new experiences from these yummy piles of goodness. There is almost always enough to share, so I spread the veg around to my friends. I never plan a menu for Wednesday nite and just wait to see what the veg box brings and cook aorund it. Many meals are just veggie around here this summer – a big change for my meat and potato hubby!! Thanks for this post. What a beautiful place! I thought a garden swing would be nice, to sit with a cup of tea and listen to the quietness! Lime basil is also my favorite! Once you go lime, you never go back! 🙂 Try it sometime with (this will sound crazy, but trust me) pears, cracked pepper, a little maple syrup, and some ricotta. YUM! I did a CSA for a while, and split it with a friend. Every box contained huge heads of broccoli and cauliflower which are the two veggies that I do NOT eat. Not even my friends and relatives who liked it could eat that much of it. So I felt like such a dork throwing it out all the time that I didn’t renew. Lisa – I wouldn’t be thrilled with that much cauliflower either. It sounds like you probably didn’t have a well rounded CSA. ~ karen! Thanks for sharing this post and information! I’d never heard of CSA farms, will be sure to look it up. I grow only a few vegetables; cucumber, peppers, hot peppers, zucchini, strawberries, with a variety of tomatoes including an heirloom, Brandy Wine. I notice there is no photo of you in what I hope was a semi-flattering pilfering outfit. Something loose and billowy with lots and lots of deep secret pockets for veggies to make their way from the farm to your kitchen in. You must have thought you were in heaven. Wow that is so wonderful to know that there are people out there that take such pride and joy in cultivating land and sharing it with others! Thanks for the link. This is a dream life for me but have to contend with my pots of veggies. I am just thrilled I have two types of eggplant and peppers. If I had acres I would be happier than that pig! Your link helps me find one in my area. Edencrest Farms does a CSA and they are just literally up the road from me. I keep wanting to join their CSA and then I get my application in too late, haha. What an awesome field trip! I’ve been thinking about joining a CSA for a while now and your wonderful post was the final push. I just can’t grow enough in my little veggie garden to feed my family of 6! I tried a ground cherry in a restaurant last year. 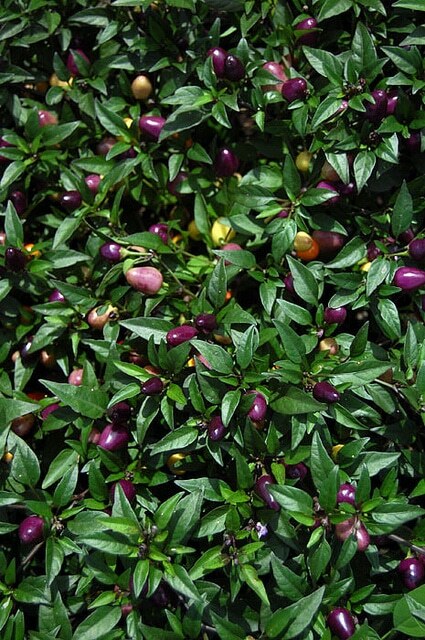 It was used as a desert garnish, and I always nibble on the garnishes; some of my friends think that’s weird. Anyway, I loved it. So I decided to grow them this year, and just started harvesting them last week. They’re awesome…and I’m amazed that I can grow something pineapple-ish in Canada. 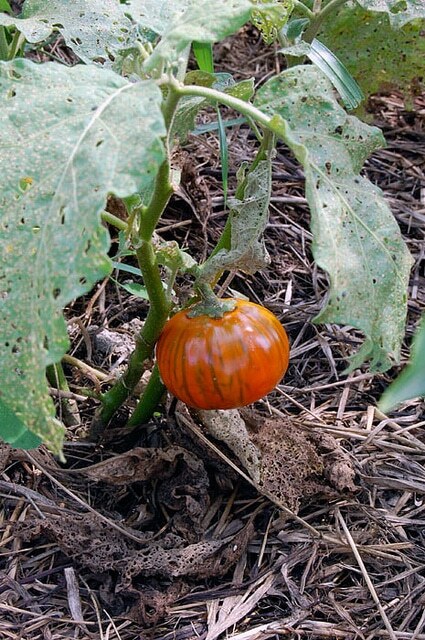 Turkish Orange Eggplant…..gotta get me some a dat! Wow, that’s amazing! An orange eggplant? I tried to grow white tomatoes one year but I couldn’t tell when they were ripe (They go from green to lighter green to light greenish yellow). I’m buying my first house so next summer I’ll have an in-the-ground garden! What a beautiful post Karen! 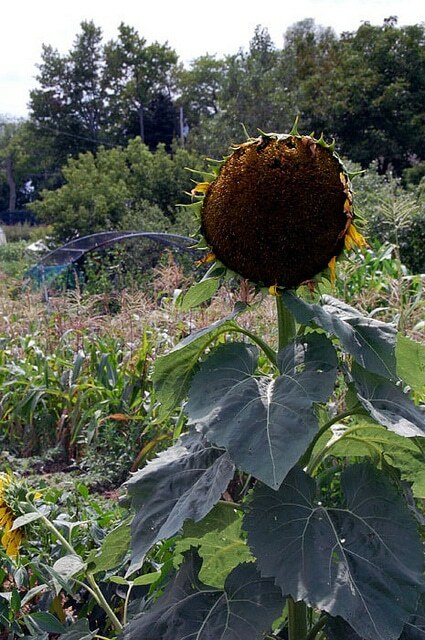 Thank you for inspiring us all to grow, find and eat locally grown veggies. Beautifully presented post! 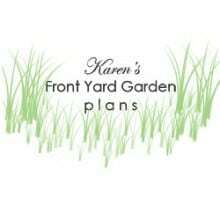 I really enjoyed your visit Karen….and the blog post. Thanks so much-hope to see you again! That’s the finest portrait of Joey I’ve seen! Ah, but photoshop can’t capture attitude. You did that! My Duddy & Nana always grew ground cherries in their huge garden, I miss them. I miss the quiet too. Lovely farm, thank you for sharing. 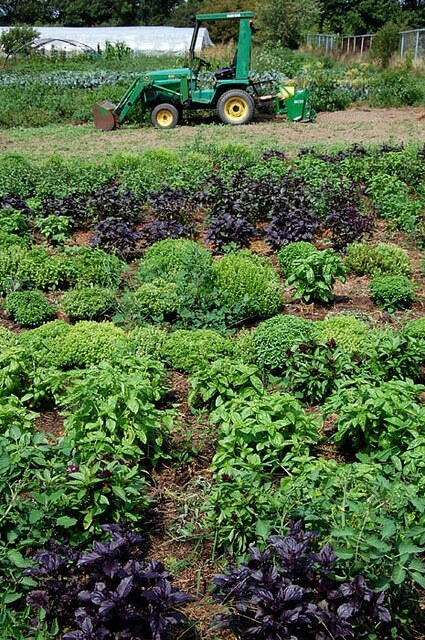 Oooo… So many pretty veggies :)… I want me some blue cherry tomatoes! Now excuse me, I have to make another batch of zucchini something… And then another batch after that of zucchini something else… Ahh, zucchini! Silly, silly zucchini! By the way, I’m mad at Martha, her heirloom, organic, patty pan squash (seeds from Home Despot–3ft and “mini”) are not mini at all… She’s a big lier, lier, pants on fire! But they are very cool looking, AND not “patty” or “pan” like in any way. What the hell? That Martha! Wonderful tour! 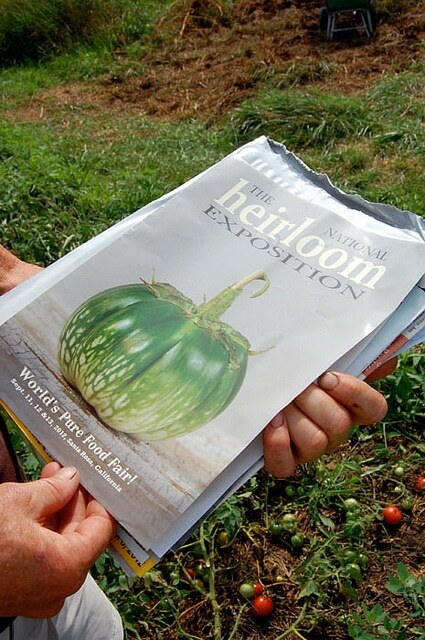 There’s a whole other world I don’t know out there, one that involves a magazine called “The National Heirloom Exposition” with all sorts of amazing, unheard of varieties of veggies! I have seen heirloom tomatoes at the supermarket, but Tendence Bleu? They’re stunning! I can’t help but feel that there’s more nutrients in those colourful tomatoes. So much nicer than the pale red tomatoes in the supermarket! Great job, Karen, you work so hard for your blog. What a lovley tribute post and what a lovely garden. I went the CSA route two summers ago after a tip from a friend – the Green Ranch in southern Sask is a great CSA provider. Thanks for the CSA links, Karen. This is something Mr. G, honey and I have been discussing for a while. Looks like there are some definite possibilities for our area. Yay! What an awesome post beautifully showcasing CSAs! I have been volunteering once a week with my kids, at a local CSA for the last 6 years. 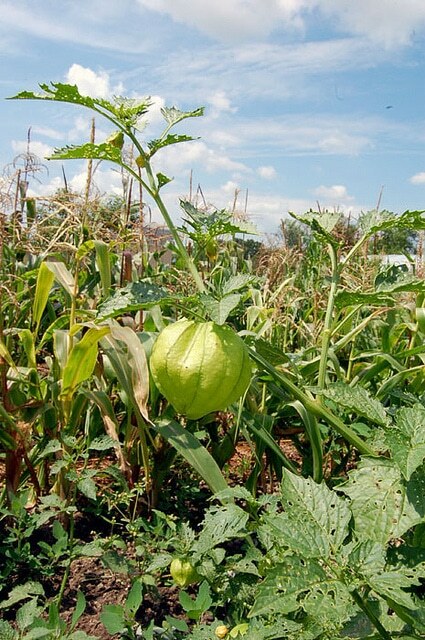 My kids are growing up, growing unusual vegetables… and know more about transplanting, crop rotation and beneficial insects vs. pests than many gardeners. Everyone should visit a local CSA at least once. For our time, we take home extras from bumper crops, seconds not quite pretty enough for the weekly baskets, eggs, honey and excess seedlings. We have a bed of ground cherries from a few seedlings that self-started in the CSA greenhouse that we dug up and brought home. 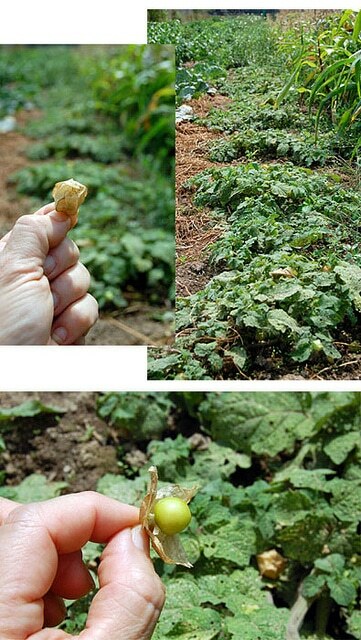 And we’ve had ground cherries ever since. My son used to pick them out of the field and often left few for the customers- they are divine. I loved all the photos! Wow, wow, wow! I am so impressed. Seeing how much can be done with just a few acres is absolutely inspirational. Anyway, great farm…I live in NY and work with farms, farmers markets, local food, etc…so I fully appreciate what Linda has done with her farm. Great photos! I love the heirloom tomatoes. Your pic of Joey is taken from a perfect angle! Thanks Lori. I can’t believe you read the site for 4 hours straight, LOL. Holy crow. I have a little secret about the Joey pic which I’m going to reveal in a week or so. ~ karen!